Would you like some Sprinkles with that? You've seen it on social media, and some got to see it at market...well it's time...I am beyond thrilled to tell you that The Land of Magic Quilt pattern is all finished, tested, edited, and done. Whew! I quickly designed this quilt for Sarah Jane Studios May Quilt Market booth, back in late April, literally finishing it on the show floor the day before opening. 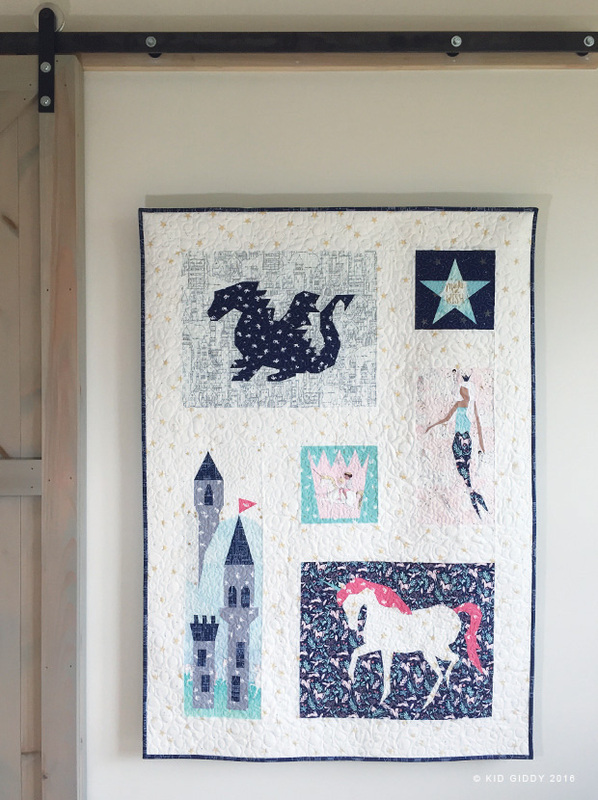 The entire quilt was designed using her MAGIC fabric line from Michael Miller Fabrics, and became something more than either of us could have imagined. In the coming months, I will share block by block details of my EQ7 design process and some sewing tips during a really fun sew-a-long with the awesome folks over at The Fat Quarter Shop and some other amazing bloggers. The Fat Quarter Shop is the only retailer selling The Land of Magic Quilt Kit , a Land of Magic Quilt Backing Set, and all of the PDF patterns. You can find The Land of Magic PDF pattern in my Kid Giddy Etsy and Kid Giddy Craftsy shops as well (in the next few days). Stay tuned here for the kick off to your own Land of Magic Quilt beginning in September! There are a limited number of quilt kits, so be sure to grab one or two as quickly as you can. If you are unable to get a kit before they sell out, I'll be posting all of the MAGIC fabric requirements here so you can piece together your own kit and start sewing with us on the kick off day. Thank you to everyone, for your love and enthusiasm regarding this quilt. It is technically my first quilt pattern (other than a mini tutorial) and I'm so grateful it has been so well received. 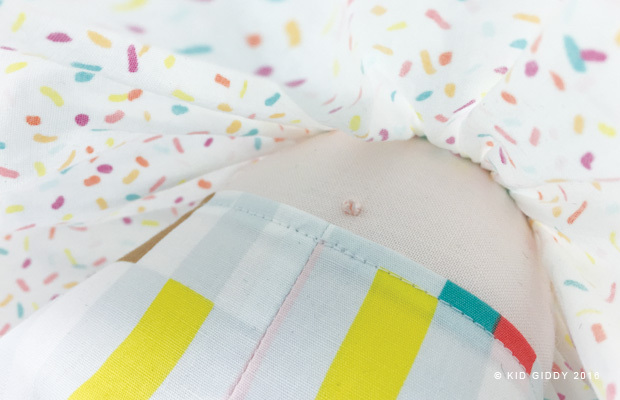 Hi everyone - Dana Willard's (MADE Everyday) Boardwalk Delight Fabrics party is ramping up, and today I'm sharing my sweet little Sprinkles doll with you. Sprinkles was always the first one in line when the ice cream truck rolled around the corner. With a quarter in her hand (I know ice cream off a truck is not $0.25 anymore - but let's go back to that sweet time when it was) she excitedly picked the Cherry Chip ice cream pop covered in chocolate and got a free warm pretzel. Everyday she tried to pick a different ice cream and liked them all, but if you asked her, she would say "anything with sprinkles on top, is my favorite". She was always decked out in her favorite playtime summer dress (the one with sprinkles all over it of course) her comfy Mary Jane's and little bows around her perfect pig tails. After her ice cream was all gone, she skipped and played hopscotch along the boardwalk until the sun was setting and it was time to go in for dinner. 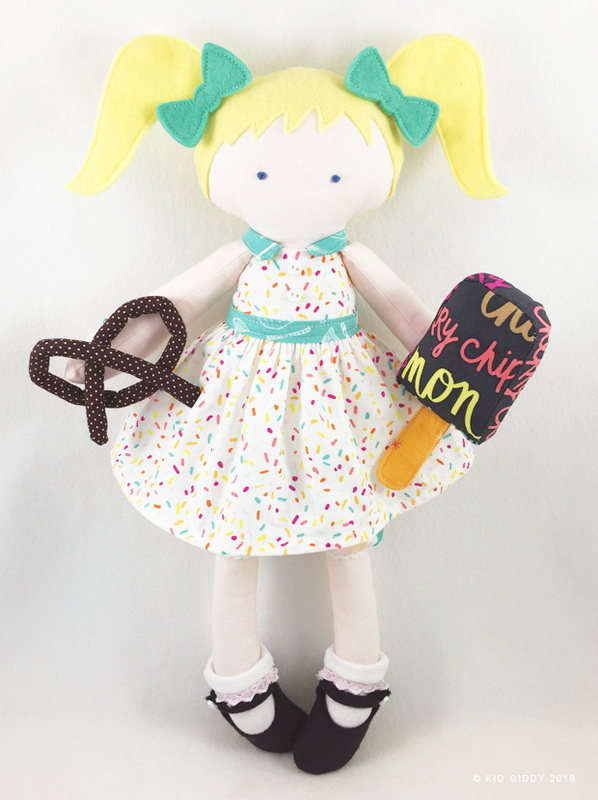 As soon as I saw Boardwalk Delight, I knew I had to make a little doll that was obsessed with Ice Cream. Sprinkles is that little girl. I was so grateful Dana asked me to make something for her Boardwalk Delight Lookbook. I loved the fun and playful vibe of Dana's new fabric line and love that it brought back awesome memories of running down the beaches and boardwalks of Long Island, N.Y. when I was younger. It reminded me of the days when guys walked past us carrying coolers filled with novelty ice cream and sodas. (Do they even do that anymore?) 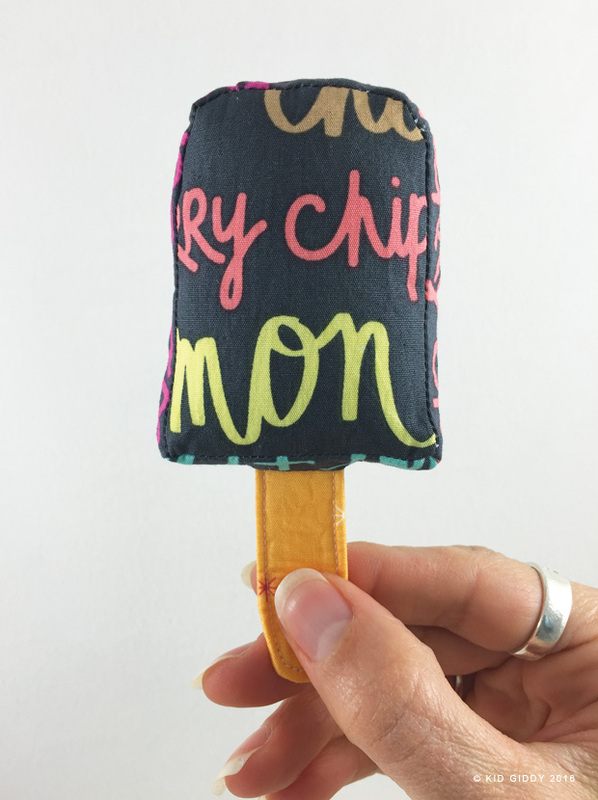 It's the perfect fabric to remind you that when you see the ice cream truck coming through your neighborhood for the first and last time of the summer...you make memories and buy ridiculously expensive ice cream, because our children will be grown way too soon and summer will be over before you know it. I have posted some other tutorials (Queen Phoebe Bunny Doll, Bubbles) that can show you how to make the dress on her. I used my Kid Giddy Sizzix Doll die for her head, body and hair. I used my Kid Giddy Sizzix Fox die for her arms and legs, as well as her socks and mary jane's. Her collar and bloomers (which you can't fully see in the pic above), were made using my new Kid Giddy Sizzix Doll Clothes die. The quick belly button is a must when making your new dolls with clothes. 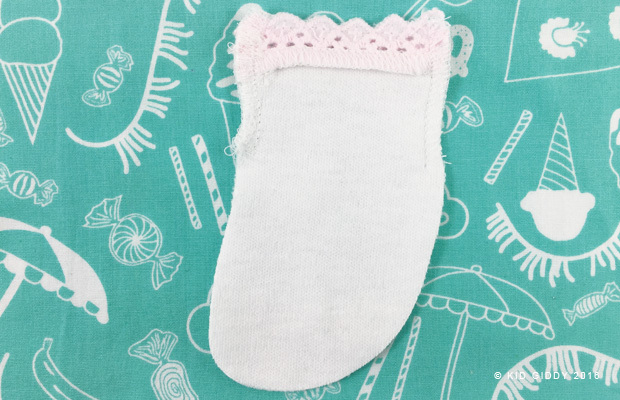 I love sharing a new tip, trick or tutorial with each new doll that I make...so if you want to make some little socks for your dolls, you can do so using my quick and easy tutorial below. This tutorial will work with the doll leg/foot piece as well as the fox leg/foot piece as shown in the pics. Step 1: Begin by cutting out 4 leg/foot pieces. Trim to desired length. 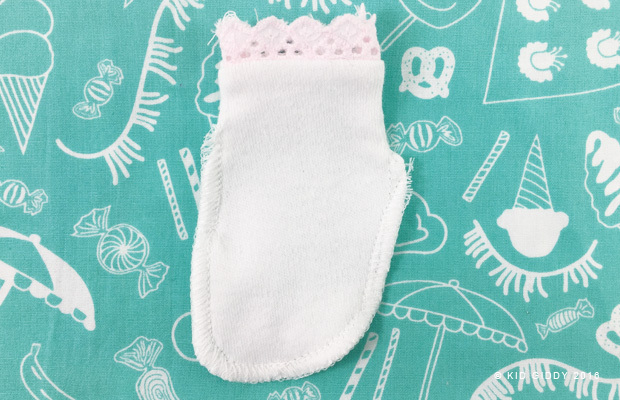 If you want to add a cute edge, do so after cutting the sock pieces from the leg/foot areas on the die so you can be sure they are all the same length. I decided to add a little cotton lace detail on the top edge of the socks (because that is how socks always were back in the day). You can do a rolled hem instead or use some other fabric trim. If you do, be sure that you put the right sides together, so the seam of the hem or edge is showing as shown below. Step 3: Turn the sock right side out (according to the top area) and sew the remaining raw edge of the sock from one side around the toe, and up to the other side. Step 4: Turn the sock right side out again (according to the bottom portion of the sock). Step 5: Fold down the top edge of the sock. All seam allowances are hidden and the socks go on and off easily. Perfect for kids learning fine motor skills. Her Mary Jane shoes were made using the same leg/foot piece on the Fox die as were the legs and socks, just cut, trimmed and top stitched accordingly. 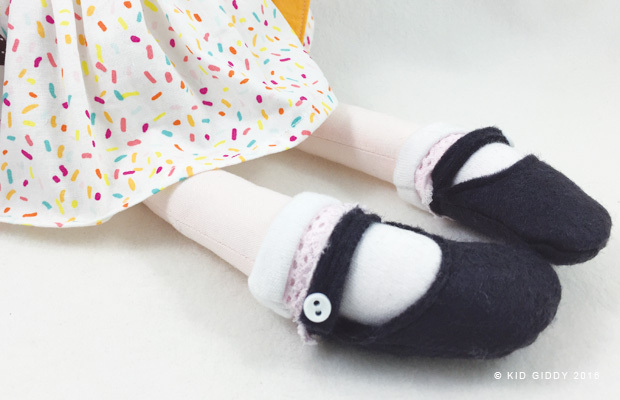 If you are making a doll using the doll legs, you can do the same thing, just eye ball it as I have done, and add a little strap and button. For more information or to find out where you can get some of Dana's new fabric, visit Dana's website (link above) or the Art Gallery Fabrics site. For more information on my Kid Giddy dies with Sizzix, please visit Sizzix.com where you can find projects and videos to help you make your own special soft toys. Thanks so much for stopping by and reading all about Sprinkles as inspired by Boardwalk Delight. 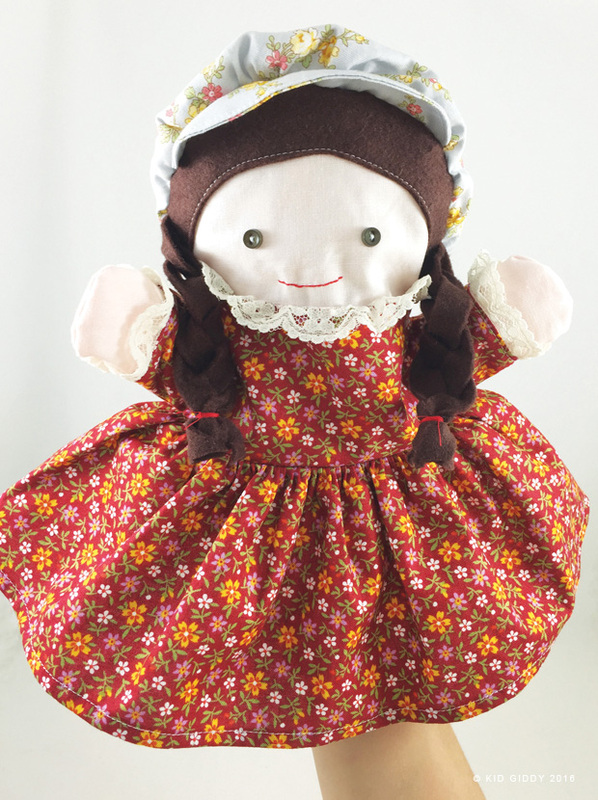 Disclaimer: I received fabric from Art Gallery Fabrics to design this doll with. Opinions are my own, and there are no affiliate links. Thank you. Need something to do this week? 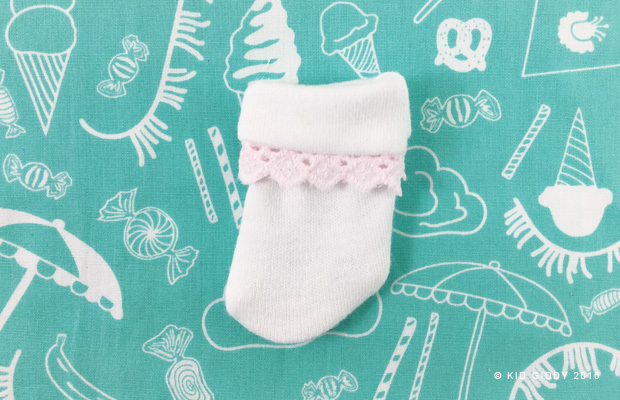 I've got a fun project for you over on Little House on the Prairie's website this morning. I've kept this little one under wraps for a while...and she won't disappoint! I grew up watching Laura and her entire family on TV after school everyday - so I was honored and thrilled to meet Charlotte (Miss Beadle) and Allison (Nellie) after making their dolls for Andover Fabrics for quilt market last fall. I'm excited to be working with the Tripp Friendly Family to create some fun projects on their website. My girls love playing with the puppet and would've loved it even more 5 years ago. You can make all of the characters you'd like based on this tutorial. I've provided all the instructions and step out photos to help you make your own Laura puppet - regardless of the size hand it will be used on. It's also reversible - so you can make two characters in one puppet. Happy sewing and reading your favorite stories on the banks of Plum Creek! Please be sure to share your creations with me - tag me on social media @KidGiddy and hashtag #kidgiddy so I don't miss it.